There have been a whole mess of new quilt books coming out these past few months, and I seem to have developed a collect-them-all urge. I’ve been bringing them home from the shop and sitting up in bed at night flipping through the pages, marking the ones I cannot live without, and admiring the planning and design and quilting that went into them. Have you all been seeing these, too? I’ve already mentioned Denyse Schmidt’s Modern Quilts, Traditional Inspiration, which I continue to treasure and flip through every time I walk past it in a room. These others I’ve snagged in the past couple of weeks, and they’re keeping me up at night. 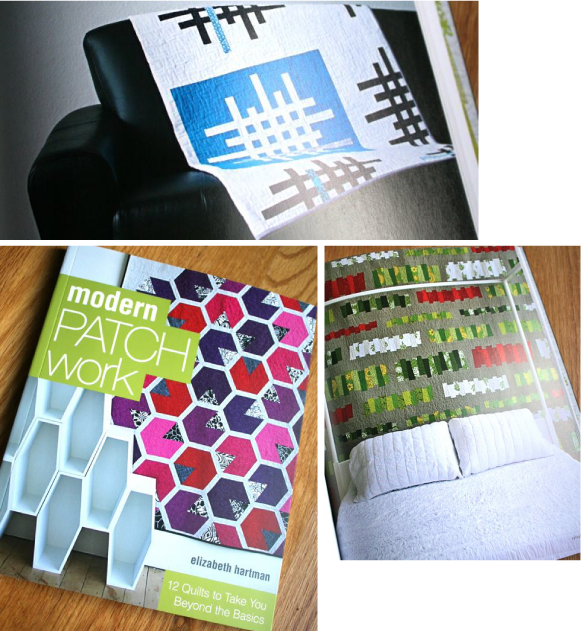 Elizabeth Hartman‘s new book, Modern Patchwork, is lovely, as you’d expect. 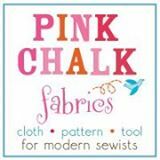 I like that she’s designed each of the projects around a very specific goal: offering modern quilters block patterns that will allow them to develop more advanced skills through clean, modern design. Most of us, including my Your First (Modern) Quilt class and my online Essential Quilting e-course, learn advanced piecing techniques through more traditional blocks, primarily because there is such a lack of collections of modern blocks on the market for us to utilize to cement those skills. While not all of the blocks in Modern Patchwork lend themselves very easily to a sampler quilt, they are such chic and sophisticated designs with such appealing lines that I’m already dreaming up ways to incorporate them into projects I’ve got on the back burner. 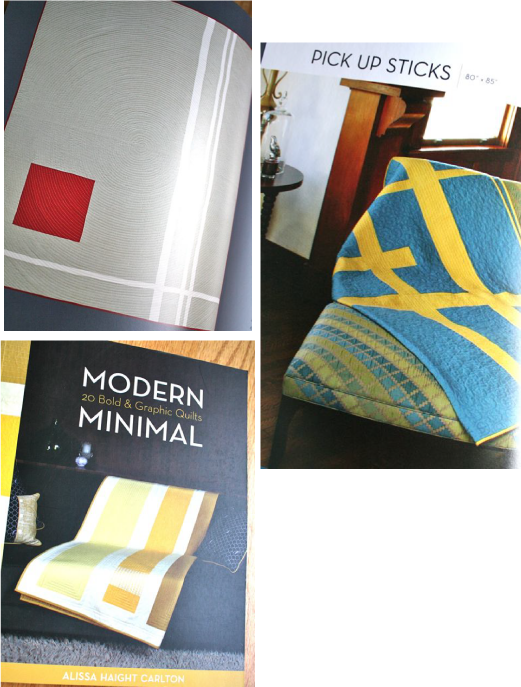 Jaquie Gering and Katie Pedersen‘s Quilting Modern is positively stunning to look at, and I was completely wowed by flipping through these pages of quilts. I’ve already admitted I’m not a frequent improvisational piecer, so this book was a huge departure from what I’m accustomed to seeing–and what I appreciated most about it was that rather than making improvisational piecing look as though it lacks skill or form or direction, they really communicate that there is planning and purpose in improvisation, that this is an alternate pathway to making a quilt rather than a cop-out (I never thought it was, I’d like to make clear, but it does seem as though there is a quiet undercurrent of criticism in more traditional circles that implies that improvisation isn’t “real” quilting and takes less skill–these ladies do an exceptional job of demonstrating how far that is from the truth). The quilting stitches in this book are jaw-dropping, and once again we see the stellar work of Angela Walters, who seems dead-set on transforming the world of quilting stitches in the way that Amy Butler did quilting fabric design, or that Denyse Schmidt did to quilting itself years ago. She’s so inspiring, and the way that these three ladies worked together to plan and execute the quilting on these projects is…well…it’s kinda paradigm-shifting, to borrow a super 80s term. I had already been spending more time thinking about the quilting stitches, and realizing that in many ways, I enjoy that part of making a quilt almost more than the actual patchwork–those quilting stitches are such a tremendous impact on the final product, and once I discovered free-motion quilting, the possibilities seemed endless. 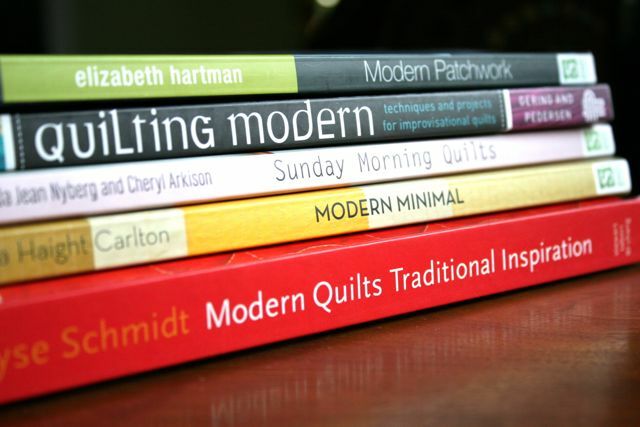 The greatest common theme I’ve seen in all these books is a far greater emphasis on the quilting itself, as opposed to the patchwork, than we’ve seen in the past few years. It felt as though, for quite a long time, the fabric and the color and the composition were the stars of the show, and we’re starting to see more attention paid to the texture and the thread and the design of the quilting itself, which is so amazingly cool. 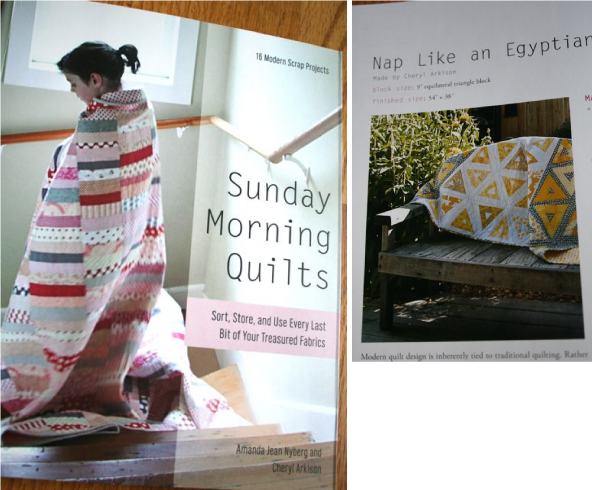 Sunday Morning Quilts, by Amanda Jean Nyberg and Cheryl Arkison, is so lovely–but my favorite part is the way it really challenges you to think about your scraps and how to use them. The simple fact that Amanda Jean uses every. single. scrap. of fabric makes me want to be even more ridiculously frugal than I already am–and to figure out where I put the box that has my existing scrap projects in it so I can get them completed. I organize my scraps a little differently than they suggest in the book–I have specific projects in mind and add scraps to those project baskets as I work–but I really like the way they’ve defined various sizes of scrap and used those to create some really great modern projects. Plus, there’s a whole idea of working with a scrap “slab” in the book that gets the gears working in my brain, imagining how those slabs could be composed and work together to create something I haven’t seen before. The photography in this book is exceptionally good, and the use of pyramids in the Nap Like an Egyptian quilt is downright inspired. Finally, there’s Alissa Haight Carlton‘s Modern Minimal, which uses all solid fabrics to create quilts with lots of negative space and clean lines and warmth to them. 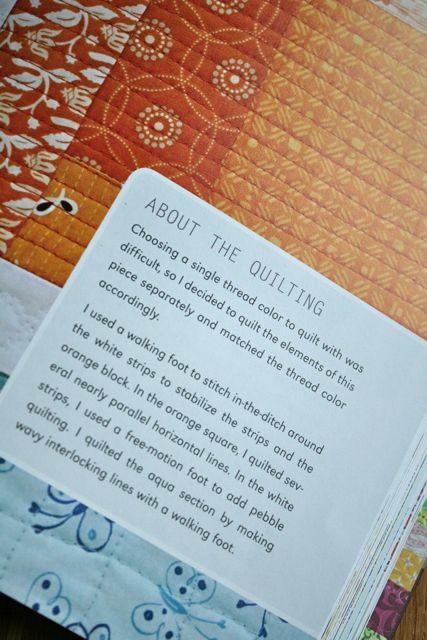 I was impressed, as always, by Alissa’s use of quilting lines to enhance the design, and loved that her book–like these others–offers suggestions for additional quilting designs that would accent the patchwork, but give a different emotional component to the quilt itself. I love the colors she chooses, and the way her designs aren’t based on blocks but instead on an overall composition that takes advantage of large pieces of fabric with an emphasis on color. 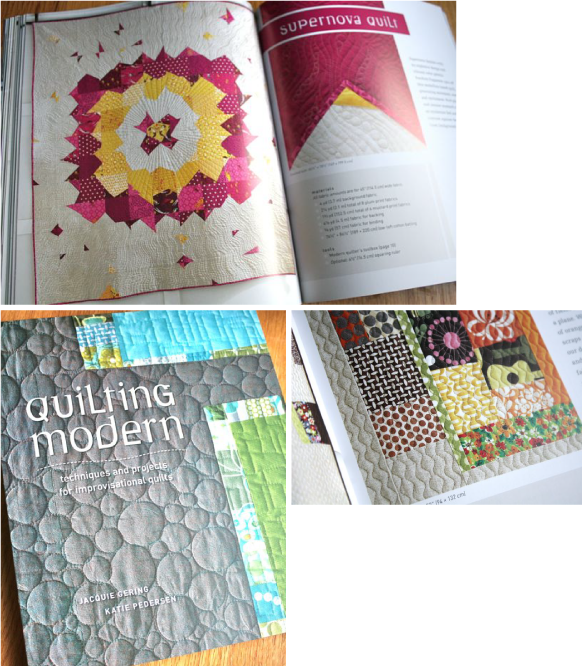 There are even more great quilting books on their way, and I can’t wait to get my hands on them. These are the minds in the modern quilting community who are pushing all of us to stretch a bit, to think differently about what makes a quilt and how to compose one, to reach beyond using a single fabric designer’s collection and begin to trust our own instincts and palette, and to challenge ourselves to experiment with new shapes and techniques and colors. I am super excited to see what these books inspire–both in me and in everyone else. Combined, these represent close to 600 pages of eye candy and inspiration, which is plenty to keep me flipping pages, marking projects and making notes loooong into the night. You might want to consider trying to dye the stripe –linen dyes beautifully and that grey/taupe might be ok if you did a dk brown or dk grey over it–if you like the texture enough and could use it in a darker shade. 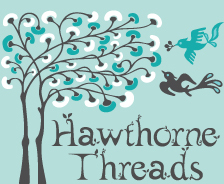 For the print–if it is lightweight enough, you could make a nightgown –i had some soft almost sheer linen and boy is it nice to sleep in when it’s warm weather. 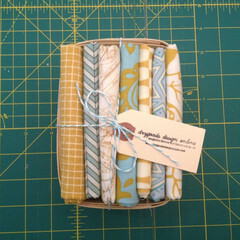 (yes, I have WAY too much linen in my stash and have experimented a bit with some buying mistakes). I really want all of these books!! 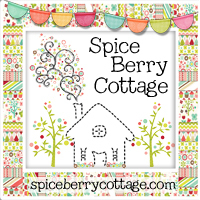 So much inspiration and tons of projects to add to my to do list Thank you again for the great advice over at Plum and Junes blog hop. 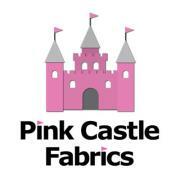 I’m really excited we are traveling to Atlanta the last week of June and I convinced my hubby to stop in to your store See you soon.